After Bitter Springs we called into the Elsey Cemetery where many of the characters from Jeannie Gunn's "We of the Never Never" are buried. Very educational. Many of the graves were moved here during 1944 when engineers were doing road construction work for the war effort. Very thoughtful of them. 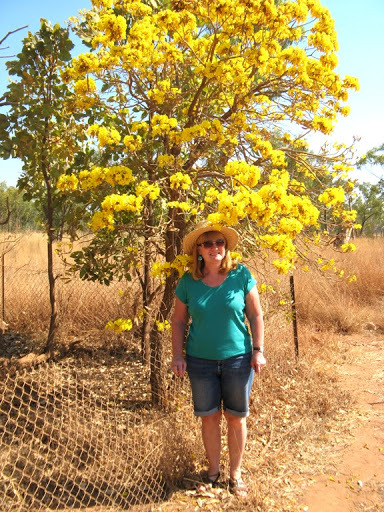 Later we took a rest stop at Larrimah, a WW11 staging post and the end of the wartime railway link to Darwin. There's a lot of history hereabouts and an interesting little museum. The Pink Pub (yes another one) has a nice but rustic native zoo behind the pub with a lot of rare birds (like the Gouldian FInch) and reptiles, including a salt water crock called Slinky Sam, rescued as orphans or who were injured. Not sure where you'd find an orphaned salt water croc in these parts though. 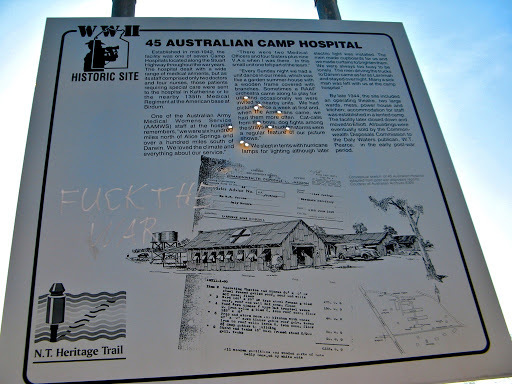 We had an ice cream because it was hot (the weather not the ice cream), even though it cost a small fortune, and headed down to the site of a WW11 No 45 Australian Camp Hospital to camp. It's lucky for the graffitist that the other side didn't win the war or his freedom to express himself would have been somewhat curtailed. In fact people with that few brain cells would have been exterminated. Heading south again, we called into a memorial to Alexander Forrest who reached the overland telegraph line here almost exactly 133 years ago, after a crossing 1500km of the continent from the west coast in 1879. For those who were paying attention earlier, you'll recall it was Alexander Forrest who built the cairn, that we visited on 1st July, on the top of Barn Hill south of Broome, before he set out east in 1879. Later we called in to the quirky Daly Waters area with is weird pub and surrounds. Around the inevitable Heritage Trail we visited their International Airport, allegedly the first in the country when an overseas flight accidentally landed here in 1929. It was subsequently taken over by QANTAS as an international airport until the introduction of flying boats which no longer needed solid runways to land on. We looked around the old empty hanger and read all the plaques so we know it's true. We also visited the Stuart Tree, on which John McDouall Stuart is "presumed" to have inscribed the initial "S" on the tree in 1862. 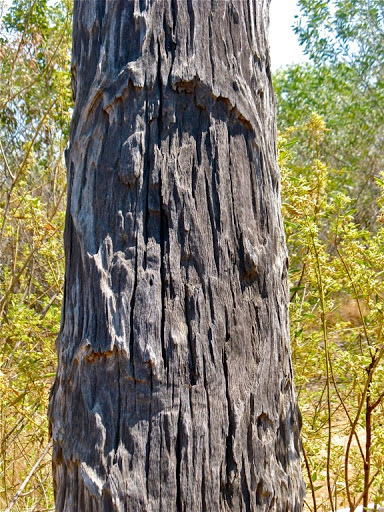 With a bit of squinting and imagination you can plainly make out an inscribed "S" in the bark of the long dead tree. Nearby are the remains of the telegraph station which was built by Stuart as part of his Overland Telegraph System from Adelaide to Darwin. That system reduced the time it took for messages to be sent between Britain and Australia from weeks to hours. 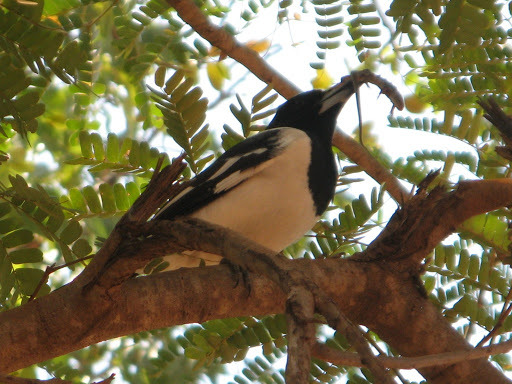 In a nearby tree a pied butcher bird was busy impaling a small lizard on a tree branch. Further south we came to the pretty little of town of Elliott. We were greeted by a welcoming sign set in a nice garden of still smouldering black foliage. 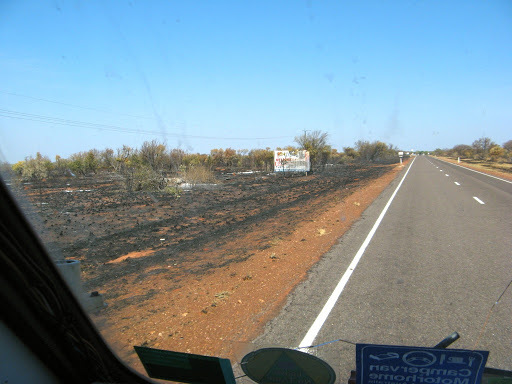 Like so many aboriginal towns we've come across, they simply have to burn everything, despite the NT Governments Fire Prevention Zoning laws. 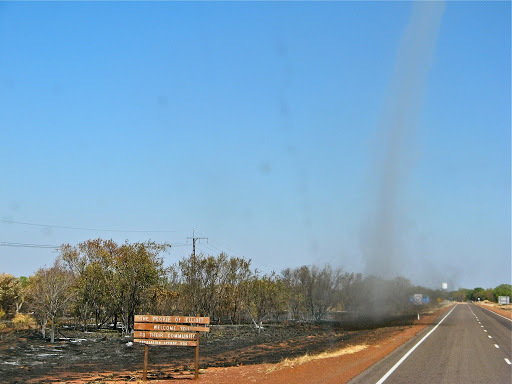 The blackened soil had developed into a black, dusty, dirty willy-willy which whirled around way into the sky and enveloped us as we drove into town. We just as quickly drove straight though, past their "Thank You for Visiting Elliott" sign. We camped down a small bush track we had discovered a few years ago, in an already burnt out patch so they couldn't do that to us again. Today we stopped to look at a WW11 Staging Post opposite Banka Banka station. 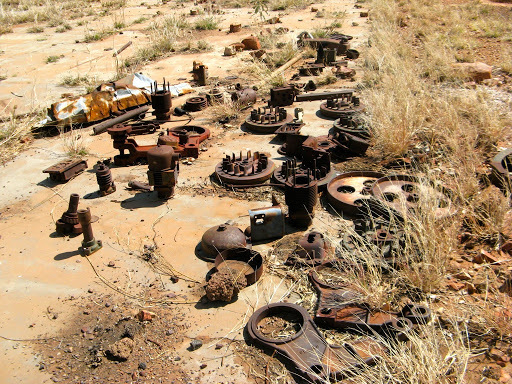 It was used to assemble and repair convoys of trucks that made their way up the then unsealed tracks to Darwin. Not much remains today except a few building bases and some heavy truck machinery and rusty parts. At lunchtime we came across a 10km section of the old Stuart Highway which is still navigable and took a detour. 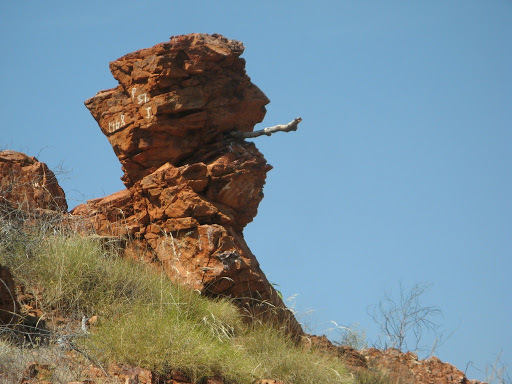 Part way along is "Churchill's Head", a rock formation which, with a bit of imagination could appear to be Churchill smoking his cigar. 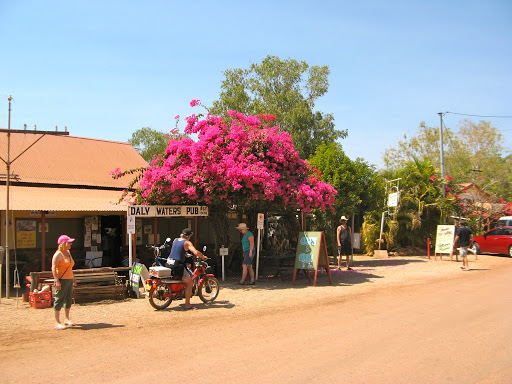 We stopped in Tennant Creek, which is also mainly aboriginal these days having started life as a telegraph station and gold mining centre, for a few groceries. Sadly the local indigenous people (and not just in TC) seem to have no will to do anything with their lives except sit in the middle of the road or wander aimlessly about. They seem to have a completely aimless existence, no self respect, no ambition, no drive, and continue to live a self-imposed, unhealthy slum lifestyle although they always have more than enough money for the weekly shopping. Surely it can't all be due to European take over of the country, all other nations who have lost wars have bounced back within a few years to their former or higher strengths. After 200 years the aboriginal people still seem to have no collective desire to do that, despite the $billions of assistance that governments continue to provide. It would appear that they are still just waiting for white fellas to go away and haven't yet grasped that it isn't going to happen. 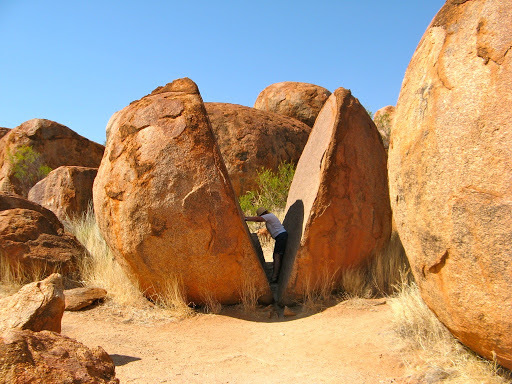 We've been to Tennant Creek before and visited all the sites including an underground tour of a gold mine, so we didn't tarry a while but set of south again towards the Devil's Marbles. We didn't quite reach them since we relocated another small bush track we'd used before and found a secluded clearing in which to camp. The daytime temperatures are certainly receding, probably no more than 30º today (compared with 36 in Katherine) and cooler in the evenings. We listened with some concern over the cold, wet and windy conditions in Adelaide and wondered if we'd started our homecoming (homegoing?) a bit too soon. Even in Alice they are still having overnight temps of 2-3º. Cool (19º) and breezy this morning but clear and sunny, our 39th day since we last saw a cloud, at Wittenoom. 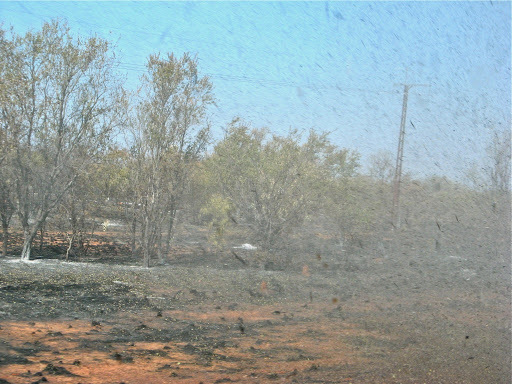 The wisps of water vapour mixed with smoke haze we saw in Katherine the other day failed to eventuate and anyway, they wouldn't have counted since they didn't cast any shade, which surely is the criteria for cloudiness? 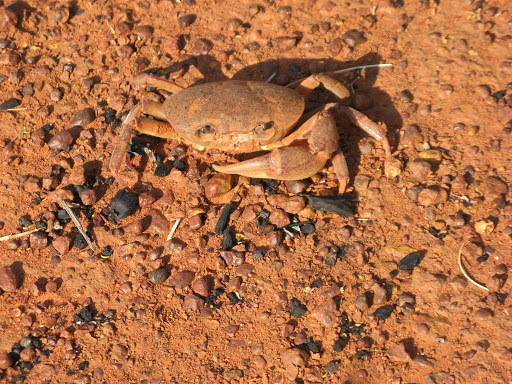 J found a desert crab (Halthusiana or Holthusiana Transversa) which rather surprised us as we didn't know they existed. It was still very much alive and made J scream when it moved as she thought it was dead. It was near a dried up water hole and presumably had laid it's eggs or whatever before the water receded and was just waiting for an eagle eyed kite to see it and have a breakfast snack. It had already lost one front claw, probably fending off a previous attack. Apparently they burrow into the soft, damp mud and plug up their hole during the dry season and await the next wet season's rain. This one seemed to have made a grave misjudgement, coming out in the dry season. 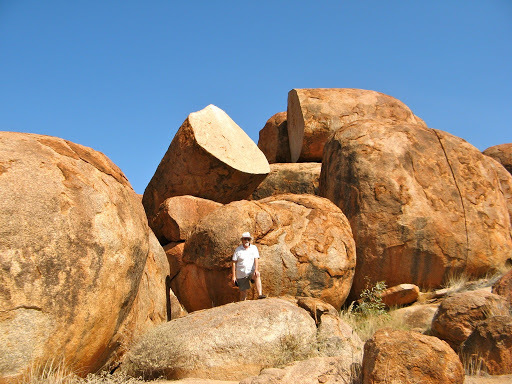 We called into the Devil's Marbles and took a wander around. The trickling creek and water hole we had seen on our last visit have completely dried up indicating a much drier wet season just passed. Then someone dropped the camera (and it wasn't me) and now the lens and lens cover don't open or close properly. I was a bit displeased but I can make it work when necessary but it will have to go back to Canon for repairs. Luckily Canon have a little known service to repair any known faults of their cameras for free what ever their age. We'd had 2 repaired this way before, but I'll have to wait until we get back to Adelaide and a repair centre. Maybe dropping cameras on the ground isn't a "known fault". Called into the Taylor Well rest area for lunch. 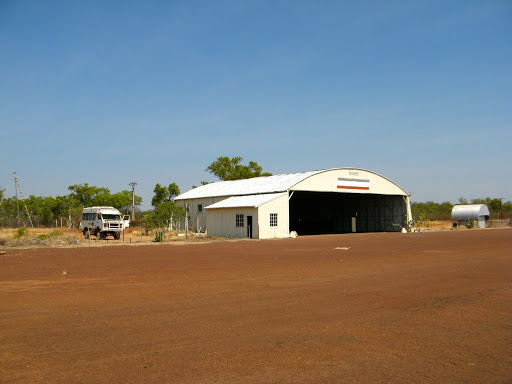 Visited Barrow WW11 Staging post just north of Barrow Creek. Lots of concrete building bases on the banks of the dry Taylor River but little else remains. Would make a useful campsite. North of Stirling Well we came across an accident. A small 4WD had overturned and spun around on its side, scattering all their holiday stuff alongside the highway. There were other people in attendance and they didn't need any further assistance from us. It didn't look like there were any fatalities as one man was lying under a tree looking hurt and shocked but otherwise seemingly OK, with other members of his family sitting nearby. All the 4 or 5 family members (2 adults and 2 or 3 young children) had escaped from the 4WD, presumably through the passenger doors or more likely windows, since it was resting on its drivers side. The 4WD had not hit anything and may have suffered a front right hand wheel or tyre failure, judging by the long curving groove in the bitumen, or overtaken someone and cut back in too sharply, rolling the tyre from the rim. A few moments later a police car and tow truck rushed up from the Ti Tree direction 60km away. A sad end to someone's holiday, we just hope no one was badly injured. 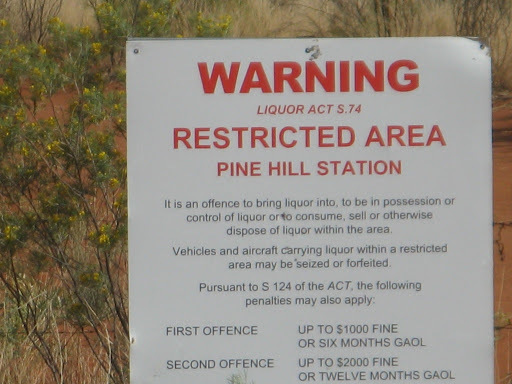 [We heard later that another man was killed in a rollover accident yesterday while overtaking a road train just north of Alice Springs. I have now started compiling a newsletter article on the subject of roll overs for the Oka Group]. We are camped at Stirling well in a lay-by we had spotted a few years back, off the highway and fairly secluded. A few wisps of water vapour are in the air but nothing is going to prevent us from reaching the 40 days and 40 nights without a cloud. Sure enough the wispy water vapour quickly cleared away and left us with our 40th consecutive day without seeing a cloud to complete our 1200km drive from Katherine down to Alice Springs. But today we had a couple of dramas and a few things of interest. First we nearly collided with a wedgetail eagle. A number of birds were feeding, as usual, on a kangaroo carcass in the middle of the road. Most birds will leave long before a car approaches but wedgies are very heavy birds and are very loathe to leave their treasure. However even they will normally become airborne just in time. Today's wedgie was more recalcitrant than most and we really thought it was going to stay put as we slowed down to drive round the carcass. At the last moment, as I swerved and stamped on the anchors, he leapt into the air and the last I remember is a windscreen full of wedgetail eagle before our bow wave caught him and tossed him up and over the Oka. Fortunately no contact was made but it would have ruffled his feathers somewhat. Next we came across another trailer with a failed suspension which is fast becoming a daily occurrence. This time a group of lads was surrounding the sad looking trailer and had the situation under control (probably, "'ave a beer mate, she'll be right"). 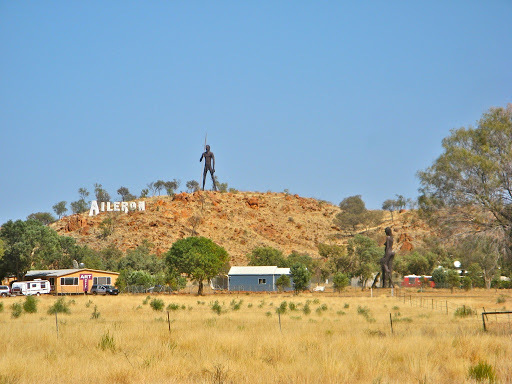 We passed through the only partially burnt town of Ti-Tree and then the interesting town of Aileron with it's enormous statues of a Aboriginal man on the hilltop and a woman and child at the foot of the hill. 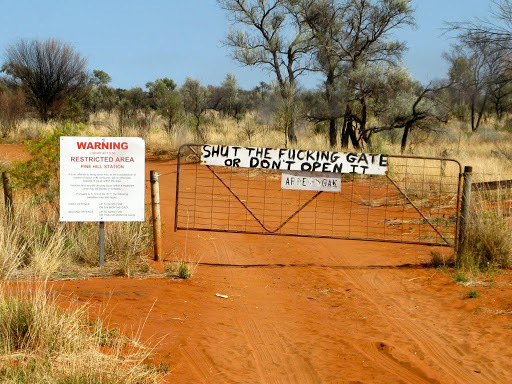 We had to take a photo of the gate into Pine Hill station. It's fortunate that the local populace have gained such a good grasp of the language. As we passed by the Tropic of Capricorn display there were a group of locals lounging around and I watched the car behind slow down intending to pull in but then carry on when he saw the locals. What a shame when they could and should be welcoming tourists to their areas. 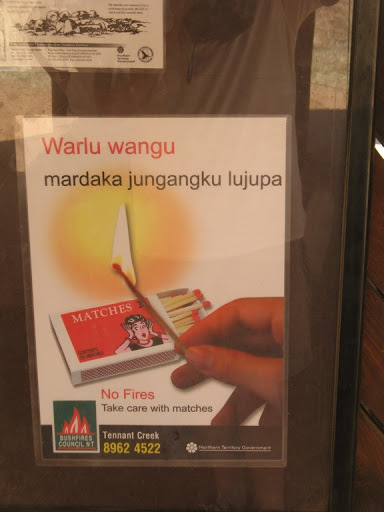 ("Respect our Ways, Respect our Country" their signs say but they don't practise it themselves). 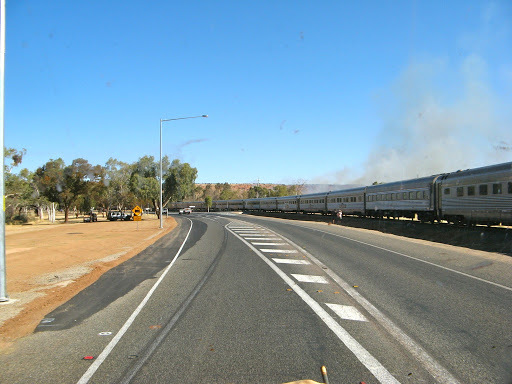 Coming out of Alice we caught up with and passed the Ghan leaving for Adelaide. On arrival we called into Woolies fuel outlet to replenish our thirsty tanks as we'd done all 1200km from Katherine without refuelling. After filling one tank we pulled up at the water tap. The large lady operator came out for a fag and said "It's 50c per litre". I said "What is?" and she said "Water is". I said "What, are you serious?" and she laughed and laughed her rotund head off for sucking me in. I said "In that case I want 1/2 a litre and I'll need a written receipt" which made her laugh again. I told her I would take my custom around to Coles and she said "I don't care, I only work here and anyway their price is higher" and she laughed even more. A very entertaining interlude but we got our water and fuel. 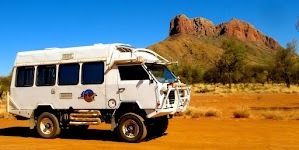 We are camped at the same location just south of Alice Springs where, 2 years ago we got bogged. 4º over night but with no wind it didn't seem too cold and the warm sun has rocketed up the temperature to 8º by 8.30am. 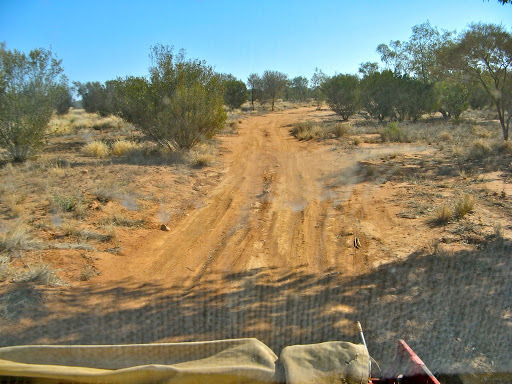 Continue the final section of our trek here, from Alice Springs to Home via the Old Andado Track and Oodnadatta Track.